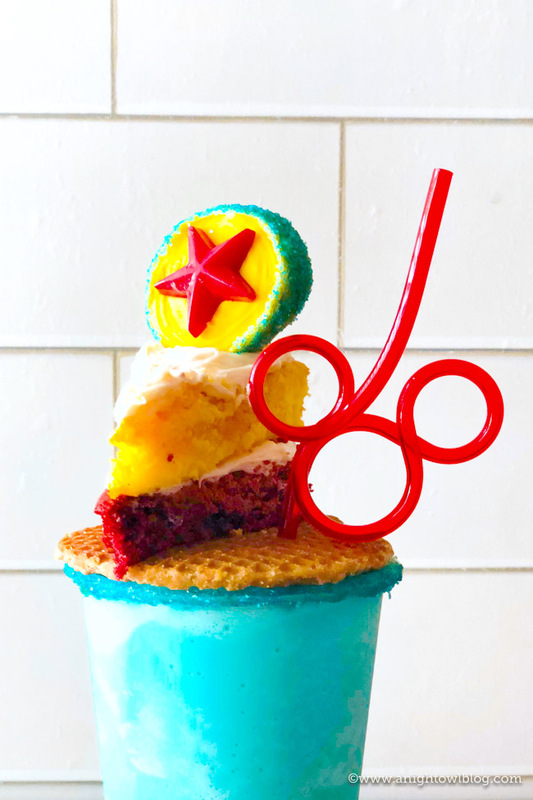 Topped with a Pixar Inspired Cookie Pop and a homemade Pixar Lemon-Raspberry Cake, this Pixar Fest Inspired Freakshake is a festive way to bring the fun of Disneyland’s Pixar Fest home! Hi friends! 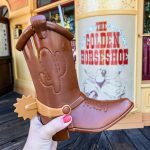 You know we’ve been talking about Pixar Fest around here a bit, especially with our recent article on The BEST Disneyland Pixar Fest Food Finds! 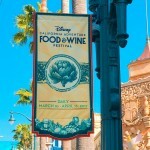 We’ve been so inspired (and frankly, we’re missing the fun treats from Pixar Fest) that we wanted to create some of the fun right here at home! Our inspiration for this brightly colored milkshake? 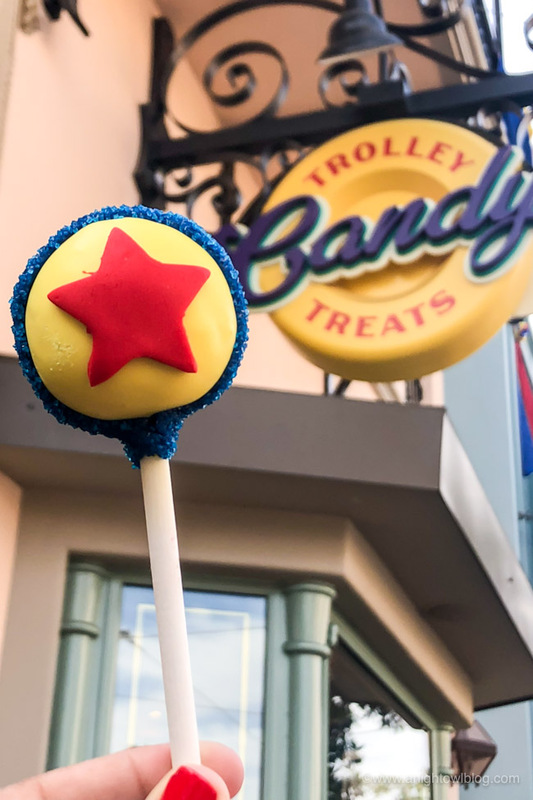 The Pixar Cake Pop and Pixar Lemon-Raspberry Cake! So we started with a homemade version of the Pixar Cake Pop. Instead of cake, I thought it would be a little easier to make a cookie pop. 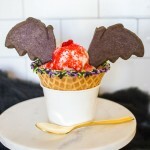 If you need instructions just how to do this, you can get the how-to from our Lion Guard Cookie Pop post. I covered a golden Oreo with yellow candy melts and topped with a red star that I created with this Star Shaped Candy Mold. While the edges of the cookie pop were still warm, I dipped them in blue sugar sprinkles. Then for the Pixar Lemon-Raspberry Cake I used premade cake slices I found at our local grocery store. You could make your own from scratch, use a box mix – whatever you feel up to to get that Pixar cake slice topper. 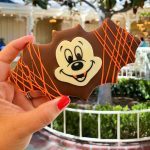 The frosting is cream cheese, just like the Disneyland version. The milkshake is a simple vanilla ice cream milk shake with blue food coloring. 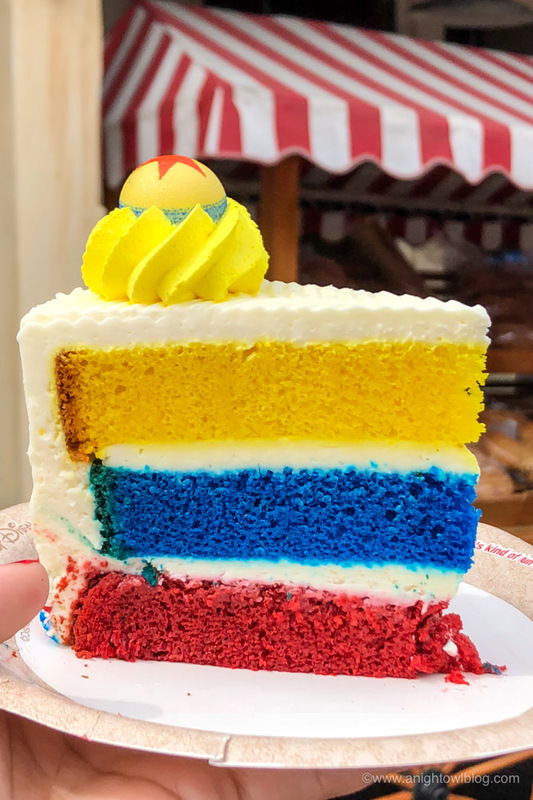 I added more blue sugar sprinkles to the edge of the cup (first dipped in honey), filled with the bright blue milkshake and topped it with a Stroopwafel so we’d have a base for the yummy cake. 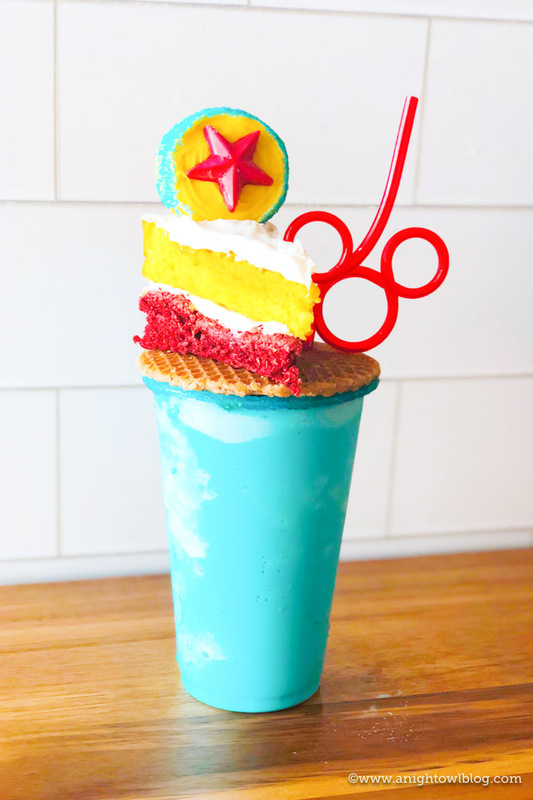 I also stuck one of our fun Mickey shaped straws through the wafer, then added the cake and our Pixar Fest Inspired Freakshake was ready to go! 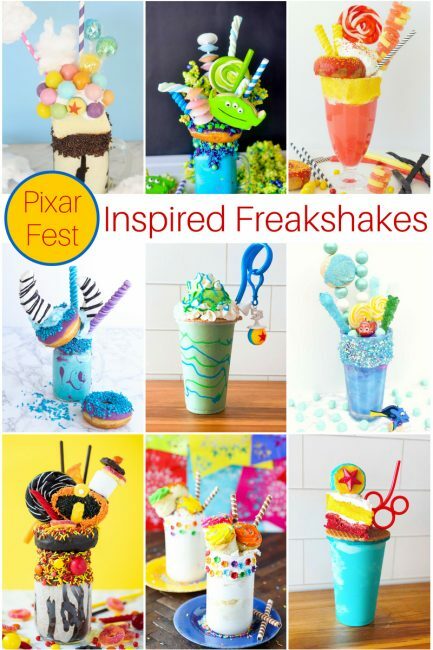 If you’re looking for more Pixar Fest Freakshake Inspiration, take a look at these beauties by some of my gal pals!